Among those famous magnetic speaker driver unit and speaker driver magnetic assembly manufacturers, it is a professional supplier in China, welcome to wholesale ferrite or neodymium magnetic speaker drivers, permanent loudspeaker driver, permanent driver units, driver unit from our factory. Magnetic speaker driver is individual transducer that converts electrical energy to sound waves, typically as part of loudspeaker, television, or other electronic devices. Neodymium compression drivers deliver stunningly accurate high frequencies. Featured with small sizes and light weight, neodymium interior speaker magnets are widely used in speaker drivers which installed in telephone, computer and some electric-acoustic toys. Magnetic circuit is composed of one or more closed loop paths followed by magnetic flux. The magnetic flux is usually generated by permanent magnets or electromagnets and confined to the path by magnetic cores, although there may be air gaps or other materials in the path. Speaker drivers are the primary means for sound reproduction. They are used among other places in audio applications such as loudspeakers, headphones, telephones, megaphones, instrument amplifiers, television and monitor speakers, public address systems, portable radios, toys, and in many electronics devices that are designed to emit sound. 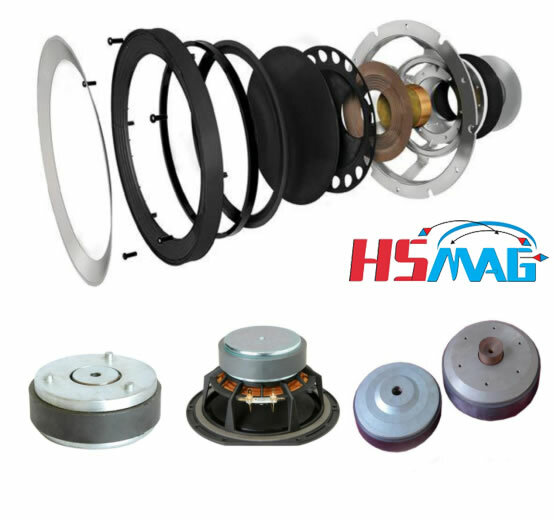 HSMAG is devoted in studying and manufacturing of Magnetic speaker drivers for many years. We can design and manufacture many kinds of speaker drivers in accordance with clients’ requests.